Wendy Sharpe is one of Australia’s leading artists and is recognised for her confident and exuberant paintings which depict love, passion and daily life. 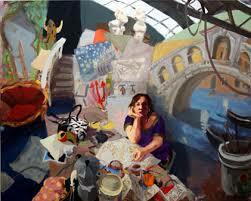 Her expressionist depictions of voluptuous women – often guises of herself – are filled with life, colour and movement. Wendy Sharpe (b.1960 Sydney) has been a practicing artist since the mid-1980s when she was awarded the Marten Travelling Bequest at the age of twenty six which allowed her to travel to Europe and explore the great collections. Since then she has been awarded the Portia Geach Memorial Award twice – 1996 & 2003, the Archibald Prize in 1996 and in 1999 was commissioned as an official Australian war artist by the Australian War Memorial to document peace keeping activities in East Timor. This exhibition is the first opportunity to examine the artist’s work in depth and allow appraisal of her contribution to recent Australian art. Her work is recognised for its confident drawing and expressionist brushwork with the artist often featuring as the main subject in her work. This important survey exhibition will comprise major paintings and drawings from public, private & corporate collections, and also include colourful sketchbooks from her extensive travels. Sunday 6th March, 3pm Wendy Sharpe Floor Talk – Join Archibald winning artist Wendy Sharpe for a tour of her exciting survey exhibition and hear about her inspirational life and artworks. Sunday 20 March, 3pm Scott Bevan, ABC Journalist, along with artist Wendy Sharpe discuss their journey together through war torn East Timor, where Sharpe was commissioned as a war artist. Sunday 27 March, 3pm Jane Watters, S.H. Ervin Gallery Director, discusses the significance of the Cite Internationale des Arts, Paris and its impact on emerging artists such as Wendy Sharpe. 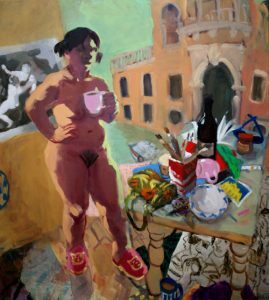 Sunday 3rd April, 3pm Wendy Sharpe and Bernard Ollis – Join Wendy Sharpe and her partner Bernard Ollis for an intimate insight into the life they share together as artists and regular travellers to Paris. Sunday 10th April, 3pm Courtney Kidd, Arts Writer, discusses her relationship with Wendy Sharpe and the writing of the new Wendy Sharpe monograph. This will be followed by a floor talk by Wendy Sharpe.